I love having lunch with my mother and before opening TaylorMade Market, we did our share of “dining research” from all the local places to eat. I specifically remember a Bistro, I won’t say the name…It’s not a good memory. This particular experience was a lesson in what I didn’t want my restaurant to be. We sat down to order and there were only 2 vegetarian choices for me. I ordered the vegetable quiche, my mother ordered a chicken salad sandwich. 45 minutes later, we were finally served a slim slice of quiche with 2 grapes on the side and a small croissant with a scoop of chicken salad made with canned chicken. ALL of the vegetables in my quiche were raw and crunchy and the pastry was dry and bland. It tasted of only egg & raw veggies. I knew quiche was a very popular breakfast item that I wanted on my menu but I already had a swiss chicken quiche and my mom was trying to convince me to only have one.. I wanted a vegetarian option so I thought a roasted vegetable frittata would be great.. It was. The other thing I didn’t like about the bistro was we spent $28 for 2 on lunch. While we were walking to the car, I said “I’m still hungry!” She replied, “Me too”. What a shame to spend $28 for a meal and still leave hungry. I NEVER wanted any of my customers to have that experience, so we always offered large portions of all our dishes and our most expensive item was $9.95 that included a Main Dish, any 2 sides, a homemade biscuit & drink. So today, I’m going to share with you another one of my (and many others) favorite vegetarian recipes. 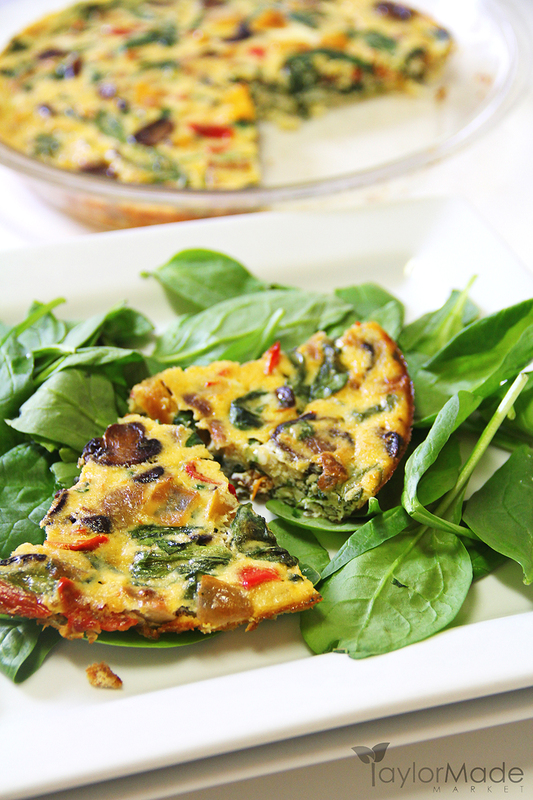 This is a great hearty breakfast that won’t weigh you down or perfect for a healthy light lunch with a salad. 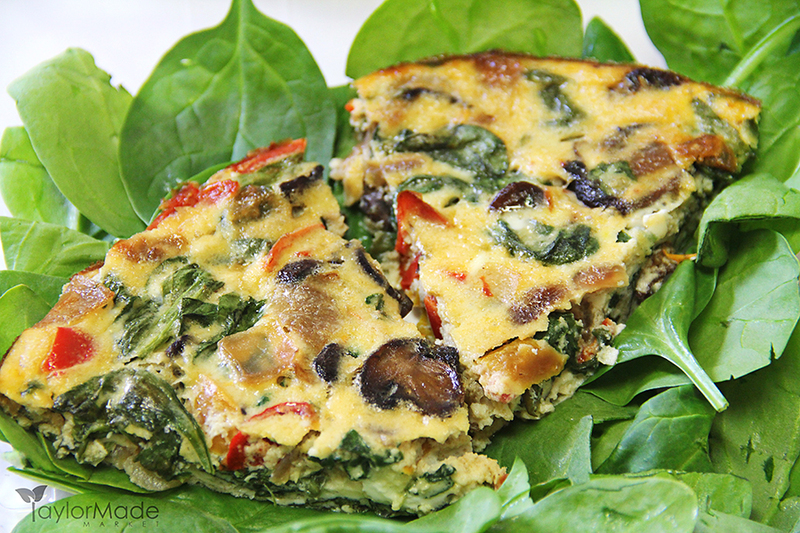 What exactly is a frittata? 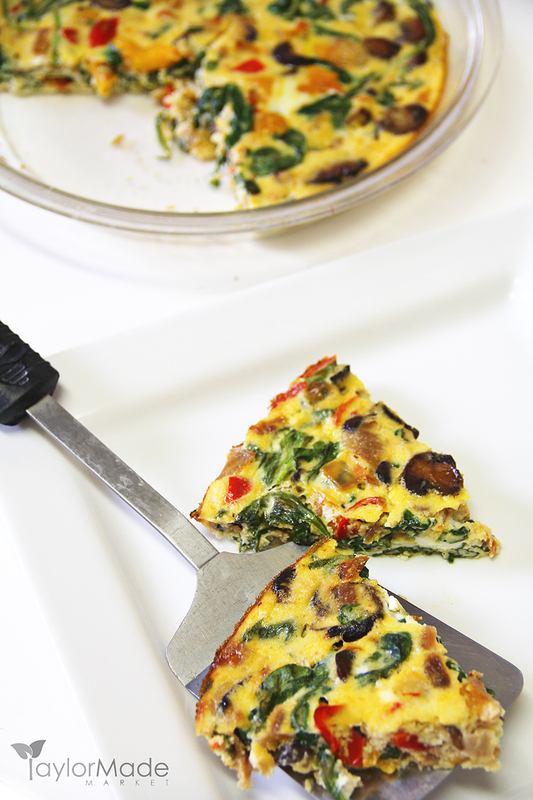 It’s basically a crustless quiche. This recipe was such a favorite in our restaurant, we added it to our daily lunch menu by request of customers. I used to make a minimum of 10 of these per week. I could do it with my eyes closed…as long as I had all the ingredients at hand. FULL DISCLAIMER – One of the reasons this recipe taste so amazing is because majority of the ingredients are either roasted, caramelized or sautéed before baking. PLEASE do not attempt this recipe with raw ingredients.. It will NOT taste the same. I LOVE roasting vegetables.. It brings out the naturally sweetness in just about anything. When you start with roasted peppers, caramelized onion and sautéed mushrooms, you know it’s going to be good. I’m able to put this together in a short amount of time because I always have roasted peppers and caramelized onions on hand. It’s easy to do and saves me TONS of time in the kitchen and adds incredible flavor to any dish. I wrote a post on roasting the easy way.. You can see it here: How to roast peppers & caramelize onion, the easy way. 4 tbsp olive oil, divided. Arrange the chopped peppers & onions on a sheet pan, drizzle with 2 tbsp olive oil, sprinkle with salt and roast 425* 20-25 min stirring occasionally until tender and edges start to brown. In a saute pan, heat the remaining 2 tbsp olive oil and sauté the mushrooms for 3-5 min until tender. Place mushrooms in a bowl and set aside. In the same sauté pan, add spinach and heat just until bright green and slightly wilted. Remove from heat, set aside. In a LARGE bowl combine the room temperature goat cheese, eggs & half & half (or cream). Mix together well. 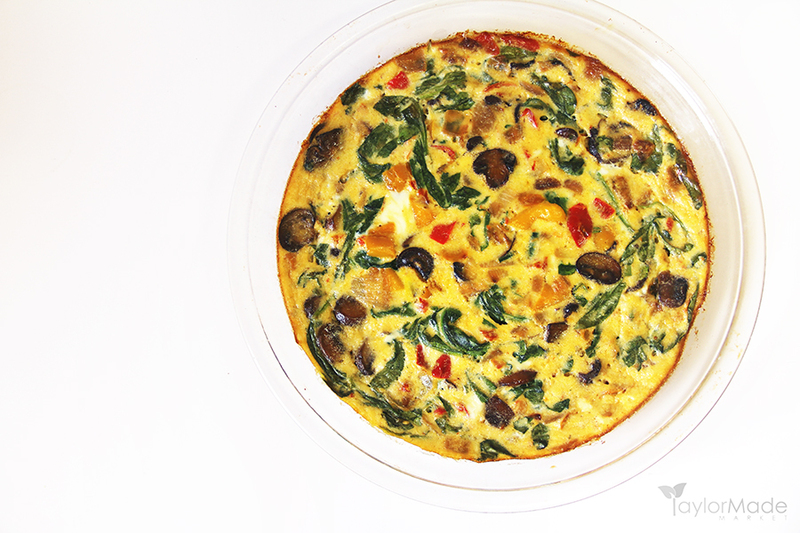 Add the cooled ingredients: roasted peppers & onions, sautéed mushrooms, spinach & sundried tomatoes, herbs. Stir well to combine. Pour into a casserole dish or pie plate that has been sprayed with non-stick cooking spray and bake 350* 25-30 min until lightly browned on top and set in the middle. Allow to cool before cutting.